I used to make Swiss Steak quite often in my early married years, but after we had kids, they didn't like the tomato type sauce that makes this dish. My kids never did like anything with chunks of tomatoes in it, or chunks of anything, for that matter. So, I gradually quit making it. 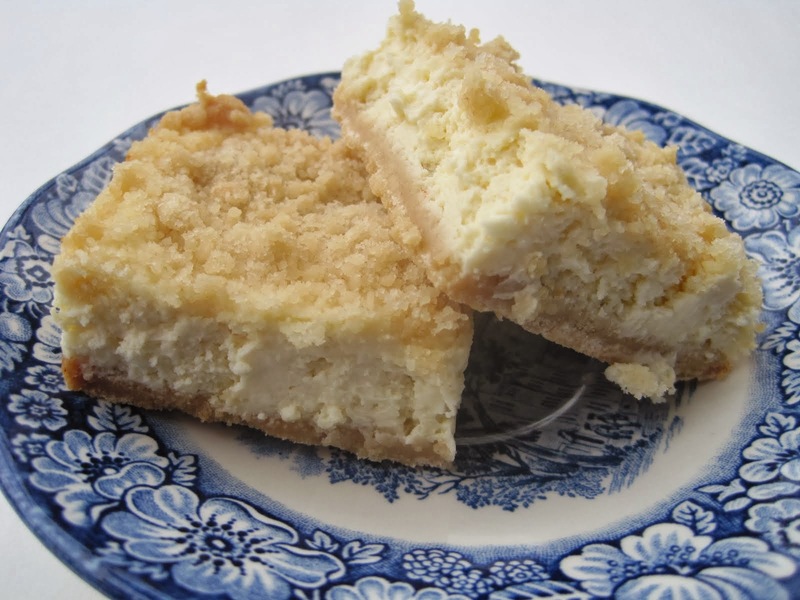 Not long ago, my husband remarked that it had been along time since I'd made this recipe. He has always loved Swiss Steak, so I thought I remembered seeing a recipe on Food Network that I wanted to try. This dish, by Alton Brown, is delicious and easy to make, but you need to plan for 1 1/2-2 hours of baking time in the oven. This recipe uses round steak. If you buy it not tenderized, then you will need to tenderize it with a meat mallet to break down the muscle fibers of the steak a little. Brown the steak in hot oil in a dutch oven; just a couple of minutes per side. 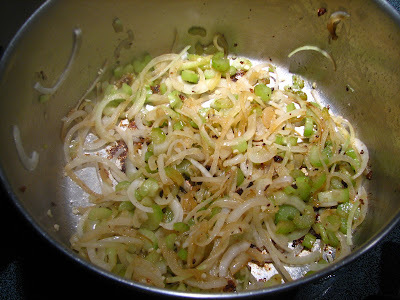 Remove meat and add the onions and celery to the pan to soften for a minute or two. This smells so good! Add tomato paste, spices, broth and other seasonings to pot. 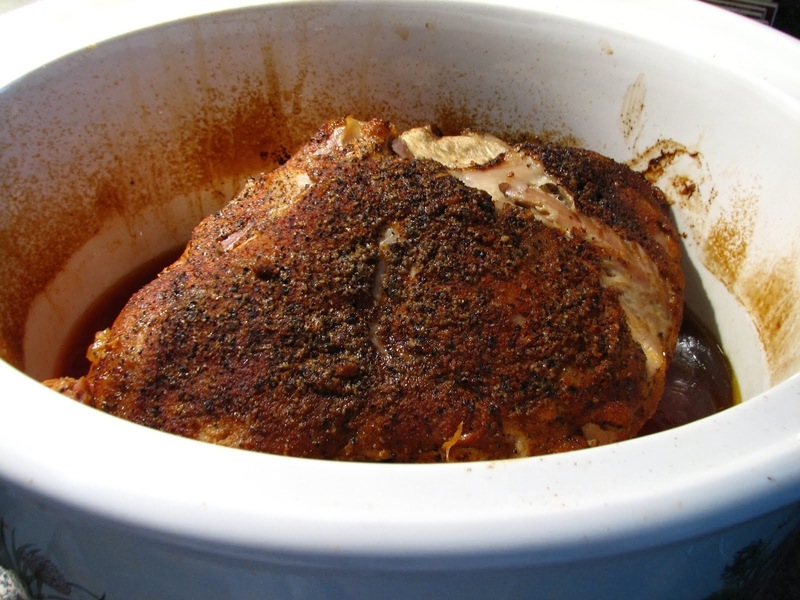 Place browned meat in the pot, submerging in the savory liquid. Cover pot and place in oven. Bake until meat is fork tender. Oh, this dish is delicious! I baked it for 2 hours and the meat easily fell apart when cut with a fork. 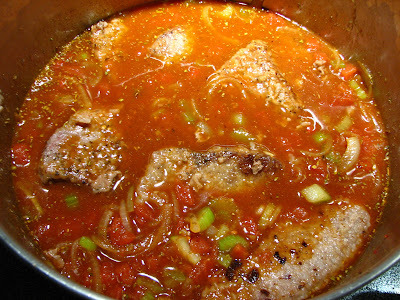 The addition of beef broth and garlic in this recipe gave this Swiss Steak great flavor, not too overpowered with tomatoes. I'll be making this often as my husband loved it. Even my daughter thought it was really good. Here's my slightly adapted version of this delicious recipe. Cut the steaks into serving size pieces, season both sides with salt and pepper and pound with a meat mallet. 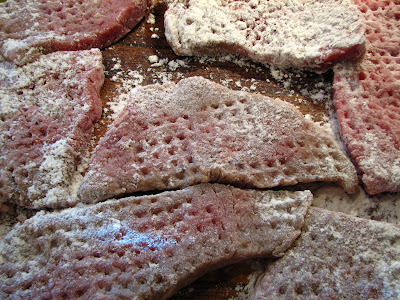 Dredge meat in the flour and set aside. Dice up the onion and celery. Mince the garlic. Add enough oil to just cover the bottom of a dutch oven set over medium high heat. Brown the steaks in hot oil about 2 minutes on each side, until golden. Remove steaks to a plate and repeat with the remaining steaks. Don't crowd the meat in the pan while browning. After removing the last of the steak to the plate, add the onion, celery and garlic to the pot and saute for 1-2 minutes. Add the tomato paste and stir well. Add the tomatoes, paprika, thyme, Worcestershire and beef broth and stir. Return the steak to pot and submerge into the sauce. Cover pot and place in a 325 degree preheated oven. Cook for 1 1/2 -2 hours or until the meat is tender and falling apart. Enjoy! I served this delicious Swiss Steak with mashed potatoes smothered with the pan veggies and sauce. Delicious! In fact, after I took picture, I ladled on more yummy sauce until you really couldn't distinguish what I was eating! It was a flavorful and comforting meal, perfect on the cold rainy day that we had. I'll be making this often. Have a great day! Looks yummy. I haven't had this in awhile- I'll have to put it back in my rotation. Lynda... What time is dinner? This looks marvelous! Like you, I had removed swiss steak from my cooking repertoire in deference to picky kids. The really good thing about an empty nest is the ability to cook anything you want...and thank goodness, my husband will eat just about anything once! meat mallets are so cathartic. 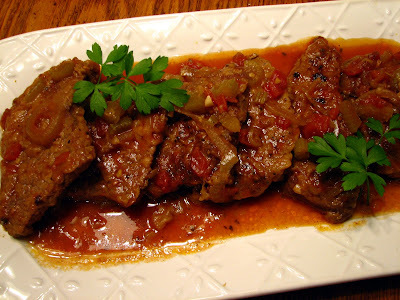 :) great recipe, lynda--i had forgotten about the wonder that is swiss steak! OK ,that looks soooooooooooooo good !!!!!!!!!!!!!!!!!!!! I love Swiss Steak. It is nice to turn to Fall type food again. Your pictures are wonderful. Absolutely mouth-watering! The only swiss steak I've had was in a yicky frozen dinner years and years ago. I didn't know that THIS is how swiss steak is supposed to be. Thanks for sharing your recipe! LOL... Only Swiss steak I ever hand was that hideous thing made in the high school cafeteria. Wow I have never made that in my life, but I sure am going to this weekend! Thanks for sharing! Yummm!!!! Swiss Steak. Good to see people are enjoying such a fine dish again as it is truly very very good. Yours looks divine!! I love steak...I'll eat steak whatever you do with 'em. 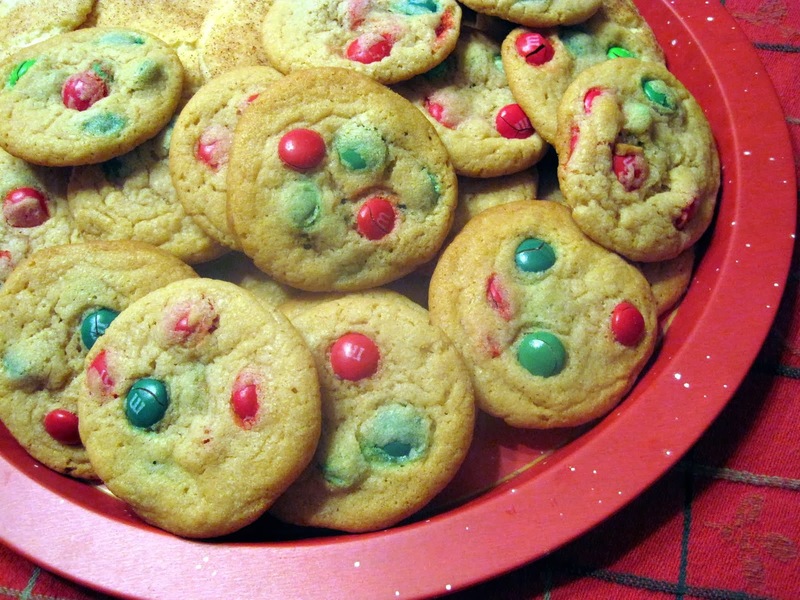 I ♥ this recipe. This is a blast from my past (my childhood). I always loved it! Thanks for the nudge. This takes me back to my childhood - it looks delicious. Swiss steak sounds delicious, I never had this steak preparation and looking forward to trying! I've never had Swiss steak, but sounds delicious. I love Swiss steak and yours sounds especially good. 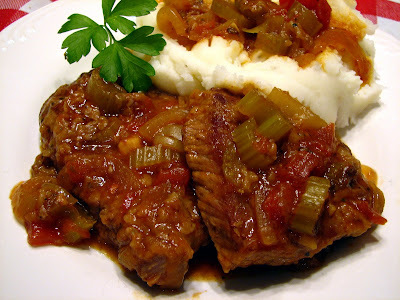 I have not thought about swiss steak in years until I read your blog. What a great dish. YUM! I can't get my husband or my children to eat any chunky tomatoes either. I haven't made Swiss Steak before, but this is the kind of meat and potatoes meal my boys would love! My Mom used to make this when we were kids. So yummy! I've only made it once - a few years ago... it was so good, why haven't I made it again??? Will have to do that! Lynda, I REALLY like this! I am bookmarking because I am going to make it! I'm drooling!